Much has changed since Mercer's contention in 1936 (20) that although "the ideal operation for fusing the spine would be an interbody fusion . . . the surgical difficulties encountered in performing such a feat would make the operation technically impossible" (21). Cloward popularized the technique and described the earliest large case series a few years later, reporting an 85% rate of satisfactory outcomes among 331 patients. His published indications were "the treatment of low back pain with or without sciatica due to lumbar disc disease" (21), with the goals of surgery including decompression of the entrapped neural elements, enlargement of the intervertebral foramina through disc space elevation, disc removal, and stabilization of the motion segment. Fig. 2. (A) Electrocautery is used to help with soft tissue dissection and hemostasis. (B) The laminar edge is identified, and the ligamentum flavum is detached from the undersurface of the lamina with a small angled curet. (C) A hemilaminotomy is accomplished with a Kerrison punch or high-speed drill. (D) The ligamentum flavum is then penetrated with a curet and removed with a Kerrison punch. (E) The thecal sac and nerve root are identified and retracted medially using a Penfield dissector. (F) An annu-lotomy can then be performed if necessary and the herniated disc is then removed with a pituitary rongeur. Fig. 3. Various titanium cages, allograft bone dowels, and allograft cancellous blocks are just some of the implements used as interbody spaces. of shapes and sizes and to the equal or greater stiffness of metallic cage designs compared with allograft bone graft in biomechanical studies (26-30). Current choices for cage implants are cylindrical devices with openings that allow bone ingrowth, promoting fusion. 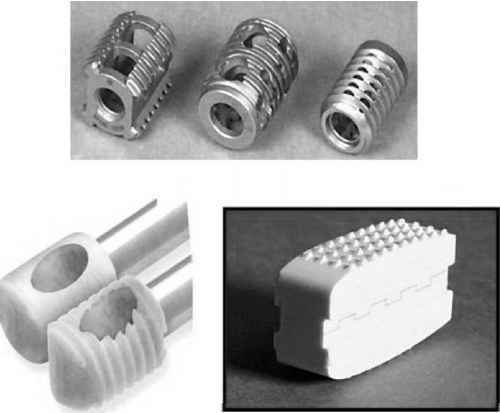 Examples include the Ray TFC Threaded Fusion Cage (Surgical Dynamics, Norwalk, CT), the BAK cage (Spine Tech, Minneapolis, MN), the cylindrical threaded interbody fusion device (Sofamor-Danek, Memphis, TN), and the Brantigan I/F cage (Depuy AcroMed, Raynham, MA). The introduction of adjunctive segmental instrumentation for improved spinal manipulation and stability (31,32) has been as significant as the evolution in graft choices. Adjunctive segmental instrumental involves the use of pedicle screws and plate distraction to elevate the disc space and allow for ease of interbody graft placement, restoring normal disc space height and enlarging the neural foramina. These technical developments have aided in expanding the indications for posterior interbody fusion to include spondylolisthesis, recur rent disc herniation, failed back surgery syndrome, bilateral or massive midline disc herniation, segmental instability, and degenerative disc disease with mechanical back pain. The technical obstacles first voiced by Mercer in performing posterior interbody fusion have been overcome, and authors have since reported excellent outcomes in 85% of patients with fusion rates of more than 90% (33,34) using instrumented PLIF. Significant emphasis is now being placed on ways to reduce iatrogenic injury to the dorsal musculoligamentous complex during open PLIF with a view toward more rapid patient recovery and shorter hospital stays. Khoo et al. (35) were the first to report their experience with the minimally invasive percutaneous PLIF (MIP-PLIF) in a cadaveric and patient series.Building on earlier work describing percutaneously placed pedicle screws, they used a combination of the METRx-MED endoscopic/microscopic tubular dilator system (Medtronic Sofamor-Danek), Tangent (Medtronic) interbody instruments, and Sextant percutaneous pedicle screw system (36,37). Each of the three patients presented with mechanical back pain, L4 or L5 radiculopathies, and grade I L4-5 spondylolistheses. Patients were positioned prone on the Wilson frame and Jackson table, and the appropriate laminofacet junction was targeted by fluoroscopy. A stab incision was made 1-1.5 inches off midline to permit fluoroscopically guided docking of the Steinman pin on the appropriate facet. 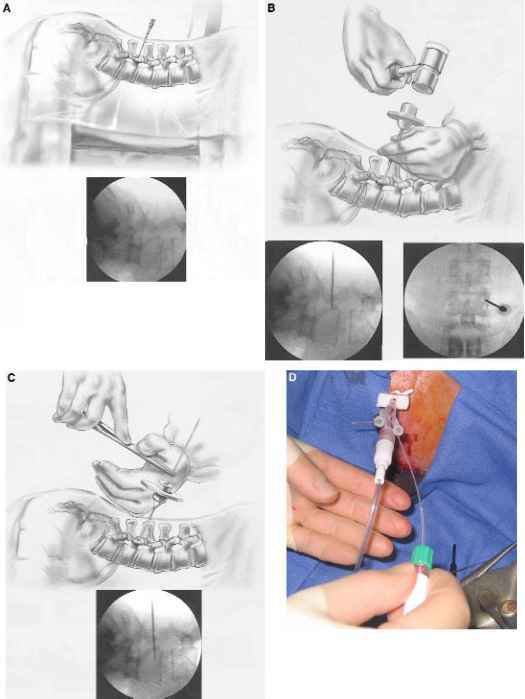 The incision was then extended to a total length of 2 cm to permit introduction of the METRx sequential dilator and tubular retractor system to dilate the lumbar musculature in a manner similar to that described above for the microendoscopic discectomy. A standard PLIF decompressive hemilaminotomy and discecotomy was performed through the METRx portal under microscopic guidance, after which interbody distractors were placed to a final distraction between 10 and 12 mm, depending on the patient's initial lateral radiographs. The contralateral hemil-aminotomy and discectomy were then performed in similar fashion and the distractor placed. Both endplates were prepared under endoscopic guidance with the round shaver and cutting chisel to remove any remaining cartilage, disc material, or soft tissue and to prepare graft troughs for the Tangent allo-graft. For bone graft, the authors employed a combination of morcellized autograft from the hemilaminotomies and iliac crest, as well as two Tangent allografts of between 10 and 12 mm in height and 22 mm in length placed with a long inserter handle. Placement was confirmed by fluoroscopy. 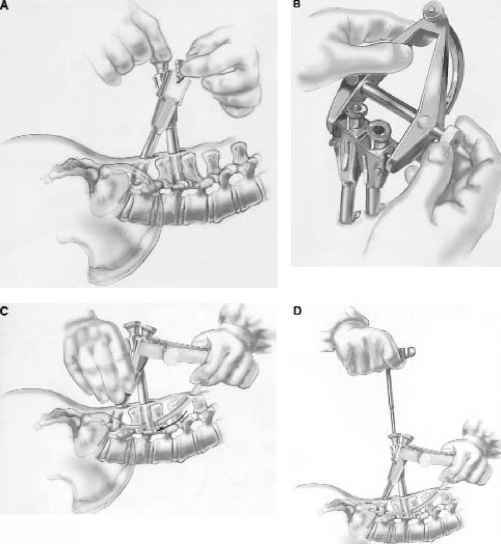 The METRx/MD tubular retractor device was then removed for percutaneous pedicle screw placement, which began with positioning a #11 Jamshidi needle on the appropriate lumbar pedicle under fluoroscopic guidance. The initial trajectory of the pedicle screws was then established by K-wire guidance followed by sequential dilation of the tract with METRx/MD dilators, and finally a preparatory tap passed over the K-wire. Sextant pedicle screws were then placed under fluoroscopic guidance, each attached to a screw extender (Fig. 4). Fig. 4. 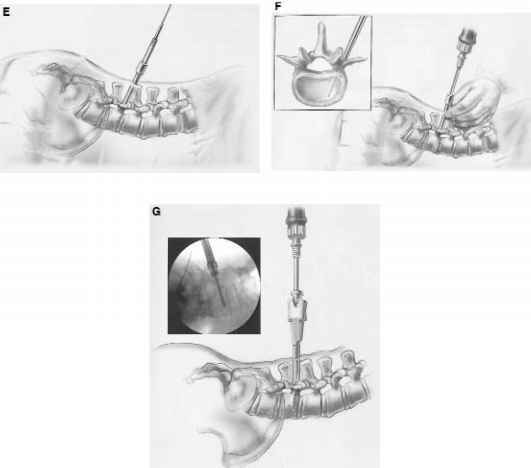 (A) A 22-gage spinal needle is placed on the appropriate lumbar pedicle under fluoroscopic guidance at the intersection of the facet and transverse process. (B) An 11-gage bone biopsy needle is then used to gain access to the pedicle. Utilizing AP and lateral fluoroscopy, the needle is advanced partially through the pedicle. (C) The inner trocar of the needle is removed, and a guidewire is then inserted through the needle into the pedicle. The needle is then removed. (D) A cannulated awl is then placed over the guidewire and advanced through the pedicle. Fig. 4. (E) Dilators are then utilized to dilate the fascia and muscle to allow eventual screw placement. (F) The pedicle is prepared for screw placement by placing a tap over the guidewire and tapping the pedicle. (G) Pedicle screws are then placed using a screw extender assembly. Rod attachment with the Sextant system depends on precise alignment of the screw heads by connecting the screw extenders outside the skin. The rod is pre-contoured in increments of either 5 mm for 1 level cases or 1 cm for 2 level cases. The rod inserter is an arc-shaped device that attaches to the screw extenders. This ensures the precise geometrical arrangement permitting the rod inserter attached to the rod to swing through a small stab incision through subcutaneous tissue and fascia along a path subtended by the screw heads. Rod positioning in the screw heads was confirmed fluoroscopically. Then a hex driver is passed through the extender sleeve, engaging the locking bolts to lock the screw to the rod while simultaneously releasing the screws from their extension sleeves by a torque-limiting break-off force. The rod inserter is then swung out of the stab wound (Fig. 5). Fig. 5. (A) After placement of two pedicle screws into, the extenders are rotated so there is no gap between them. (B) A rod inserter is attached to the screw/extender assembly. (C) Appropriate rod length is then determined using templates, and a small skin incision is utilized to insert the rod through the screw heads. (D) After verifying with AP and lateral views that the rod is seated in the heads of both screws, the set screws are then tightened. terior (AP)/lateral plain radiographs (35). Initial results with the MIP-PLIF technique—although only with three patients—are promising enough to merit larger scale comparisons of this technique with the conventional instrumented PLIF. Combining this technique with the use of synthetic cage implants could also represent a viable modification. However, as with most new minimally invasive procedures, widespread adoption of this procedure is contingent not only on larger scale efficacy studies but also on solid cost-benefit analyses that take into account the expense of all required equipment. Knowing the causes of back pain is winning half the battle against it. 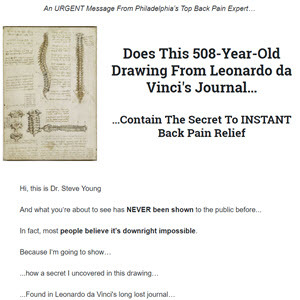 The 127-page eBook, How To Win Your War Against Back Pain, explains the various causes of back pain in a simple manner and teaches you the various treatment options available. The book is a great pain reliever in itself. 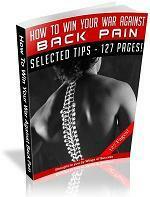 The sensible, practical tips that it presents will surely help you bid good-bye to back pain forever.